For each of our whole day and multi day courses we provide all of your raw materials, refreshments and a light lunch each day as well as a fully equipped studio with all of the tools that you’re likely to need. Glass fusing involves creating a design in glass and then heating the glass to around 800ºC to join the pieces together. (Don’t worry, you won’t need to go near the kiln once it’s hot.) The hotter the kiln gets, the smoother the finish; at lower temperatures you can make things with texture. Glass fusing is great for 3D items such as dishes and stand-up glass panels as well as jewellery, coasters, suncatchers, bespoke wall tiles, splashbacks and more. You don’t have to be able to cut glass accurately, so it’s great for beginners. Also, as no lead is involved, a fused glass course is safe for expectant mums-to-be and under 18’s. 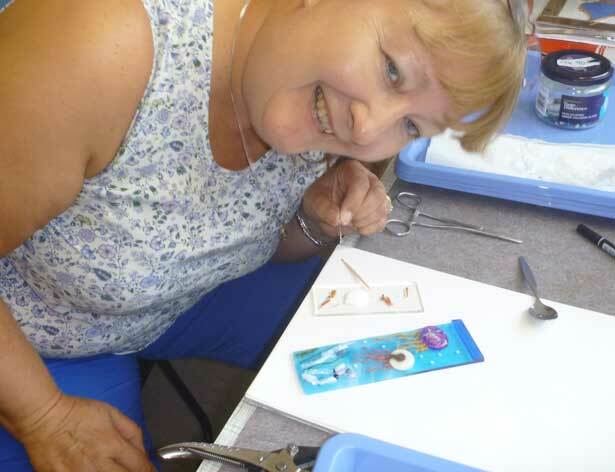 You can make fused glass art to be proud of in as little as a day, so we run one day taster courses as well as longer courses. 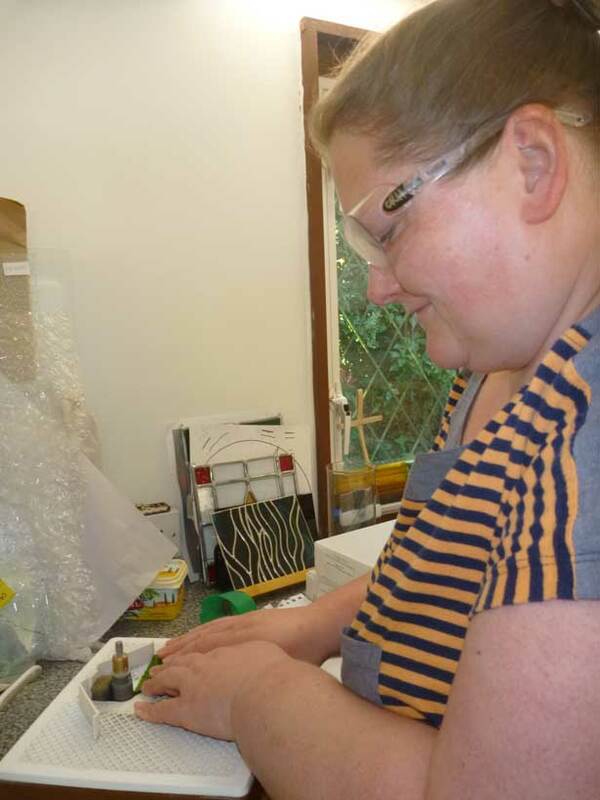 If you’re interested in coming for a course in glass fusing in Kent, click here for further details. For regular weekly classes, click here. Glass appliqué is like mosaic, but it uses pieces of colourful glass on a plain glass background, so that the light and colour can shine through your finished piece. Your pieces of glass can be whatever shape you like; they don’t all have to be the same. Again they don’t need to fit accurately together, as the spaces between them can be filled with grout. This makes glass appliqué courses ideal for complete beginners and people who lack strength in their hands. It’s also another technique that’s lead free and thus suitable for under 18s and pregnant ladies. 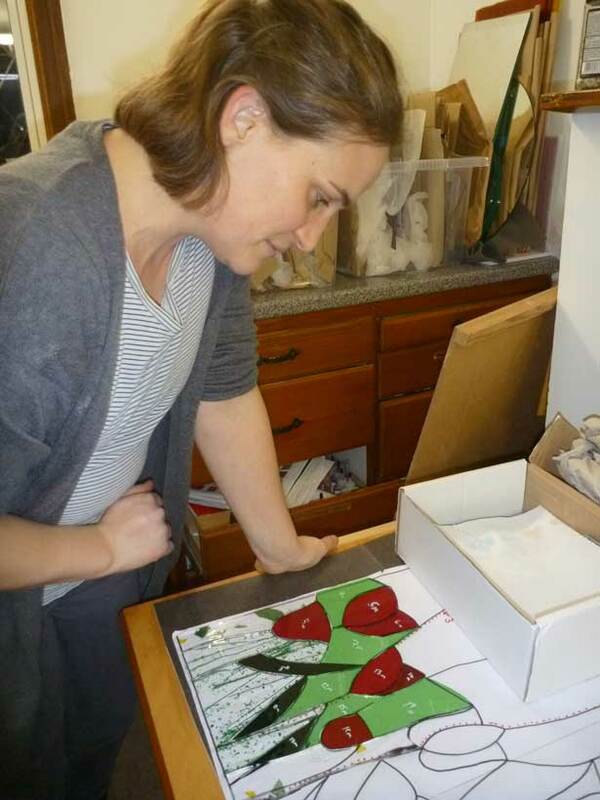 On a taster day you can expect to make a panel of around A5 size or a simple candle holder. On a course of two days or more, you can make something larger & / or more complex, with more pieces of glass. For a list of our upcoming glass appliqué courses click here. Sign up for our weekly classes and make a window for your home or a dramatic panel for your garden! Looking for a short break learning leaded stained glass? Click here for more details. Copper foiled or Tiffany stained glass is often associated with Tiffany lamps- intricate glass lamps made from hundreds of small pieces of colourful glass. It’s also popular in the USA for windows; it was developed there in the late 1800s by Louis Comfort Tiffany, a pioneer in the Arts and Crafts movement. On a short course, copper foiled stained glass lends itself to suncatchers, stained glass panels, decorated mirrors and 3D items such as trinket boxes, candle holders, desk tidies etc. 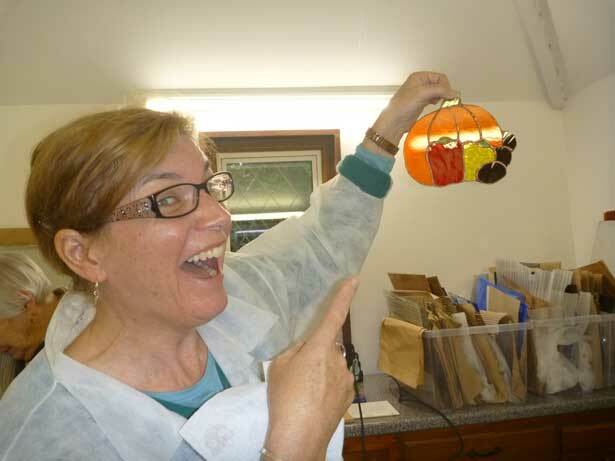 A beginner can expect to make a panel or suncatcher of around ten pieces on a two day course, starting by learning both to cut glass and to create your unique design. Clients with previous experience can progress to more complex designs & 3D pieces. Follow the links for more details of our copper foiled stained glass courses and weekly classes. Retreats are an opportunity to escape from the hustle and bustle of life and spend some quality time unwinding, relaxing in lovely surroundings and perhaps trying something new. We run two kinds of retreats- retreats for people who just want to get away from it all, and Christian retreats for people who want to spend a bit of quality time with God and make something beautiful while they’re at it. Sometimes we also run retreats at retreat centres in the southern half of the UK; these usually offer the option of full board accommodation. Some even have heated swimming pools! Ad hoc studio sessions can be booked when there are no classes scheduled, subject to availability. These are charged at £10 per person per hour. If booking for three hours or more you may add a standard fuse programme (up to 6mm) for an extra £5 per person. We also offer kiln hire subject to availability. A single fuse schedule for glass up to 6mm thick costs £20; the shelf measures 80 x 40cm. For thicker glass and longer fuse times, ring or drop us a line for a quote. You may either bring your own Thinfire or Papyros or buy Thinfire from us. Alternatively you can bring your own shelf! Because of the lead in the solder as well as the lead came used in leaded stained glass, neither kind of stained glass course is suitable for pregnant ladies or under 18s. Sorry, but please do come for a glass appliqué or fused glass course instead.